You've probably heard that the water supply in Flint, Michigan is loaded with lead and has been poisoning the city's children, along with everyone else. So far, there are 200 confirmed cases of lead poisoning among children under six, with some 9000 more believed to be at risk. That's just the kids. 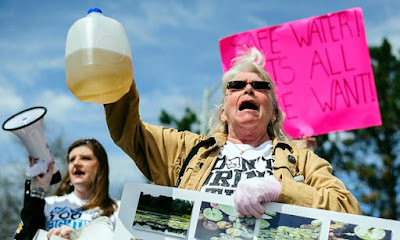 The water crisis began way back in April of 2014, when Flint's governor-appointed emergency manager (The sole dictator of municipal affairs after removing all duly elected officials from their bounden duties.) fired their water supplier, the city of Detroit, for charging too much. He then decreed, despite numerous warnings from experts, that the water in the Flint River was good enough, and ordered the water department to begin running it through the old, lead-lined pipes. The water was murky and smelled bad but the water department assured the residents it was okay to bathe in, and, more importantly, to drink. So the residents bathed in it and cooked with it and drank it, wanting to believe their government officials wouldn't be allowing them to use that nasty water if it wasn't safe. But it wasn't safe. It isn't safe. Not by a long shot. So after almost two years of going back and forth about this awful water and the dangers it held, Governor Rick Snyder was real sorry for how it turned out, and said so publicly. "I apologize for the state's part in this," he said. And says. And no doubt will go on saying. Because, words, you know, mean something. To his credit, he shut down the Emergency Manager operation in Flint (that same emergency manager he put in place even after Michigan voters overwhelmingly passed a referendum against emergency managers) and he fired a few people in high offices. So now--now something would be done! Well, okay, not now as in NOW. It's more like "Now that national attention is on us, we're going to be thinking seriously about doing something about this!" You would think, after all the hoo-haw, the governor would at last have put in that all-important call to the Feds--to FEMA--asking for an issuance of a Federal state of emergency. You would think. Well, he's getting to it. It's not time yet, he says. First he had to put out a state state of emergency, the necessary precursor to getting the Feds involved, not to mention an almost magical procrastination tool for someone who wants desperately to go on believing there's no way, no how he'll EVER need the services of those folks in Washington. You might wonder how all of this could happen, given the government resources available to the Snyder administration, just in our state alone. You, my friends, are not alone. But let me remind you that Michigan has been under a supreme, GOP-enforced dictatorship since New Year's Day, 2011. There is a long, dirty laundry list of the slow takeover of an entire state, much of it outlined in this June, 2015 Mother Jones article. Rachel Maddow has been resolute in her reporting of Michigan's plight since the early days of the takeover, when Chris Savage at Eclectablog, Michigan's foremost progressive blog, brought it to her attention. It's not as if this is anything different from business as usual. Except now people are being physically injured instead of just losing jobs or homes or going broke or hungry. This is not a takeover in the truest sense, since two elections had to take place in order to get Snyder and his GOP-majority cohorts where they are today. That means there were enough people willing to allow this to happen without regard to the rest of us--or even to themselves. These "leaders" were elected mainly on the strength of their anti-Fed, pro-state's-rights promises. Their campaigns were built on hatred, fear and mistrust of anyone in Washington or beyond. Now they're in a fix: How do they ask for federal assistance without looking like they actually (Oh, ew, gross!) need it? So here might be a good place to remind voters that when a candidate for a publicly held taxpayer-paid office says he or she is "anti-government" what they really mean is they're anti-any-other-government-except-their-very-own. Let Michigan be a lesson for you. For more on the water poisoning in Flint, see The Atlantic's What Did the Governor Know About Flint's Water and When Did He Know It? For Michigan progressive resources, see my Michigan Under Siege page. The Oregon Stand-Off That Wasn't. Isn't. Ain't.